Ants, who worldwide would match the weight of the seven billion people on the planet, live in large, highly organized, cooperative societies, practising activities from strategic army warfare to agricultural and livestock herding! In the May issue of National Geographic magazine entomologist Mark Moffett gives readers an inside look at the remarkable and highly organized skills of weaver ants. Below is an extract from the article Sisterhood of Weavers. There is also an excellent photo gallery of weaver ants - click here to view. "Scientists have likened weaver ant communication to a type of language with primitive syntax. Urban planners examine the organization of ant societies. Mathematicians draw upon analyses of ant behavior to devise parallel computing formulas (where multiple problems are solved simultaneously). Ants serve as models in all kinds of studies aimed at figuring out how big, complex jobs get done with small parts and a minimum of instructions." 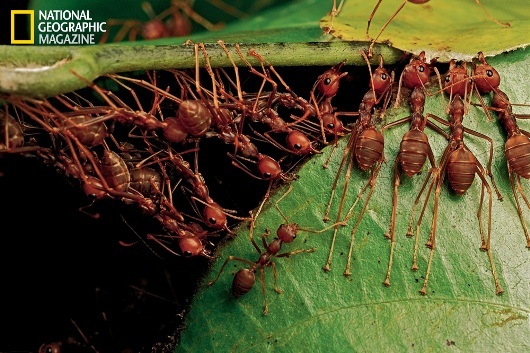 The image above describes weaver ants building a nest in Malaysia as they must pull one leaf toward another. A long body, about a third of an inch, is a boon, as each ant grabs on to adjacent leaf edges with feet and jaws. If one body isn't sufficient, the insects interlock to form chains. Check out this wonderful article now.